Stefano Tenca with Qbit Technologies, Palo Alto, Calif., demonstrates the virtual reality capabilities of the Hess Virtual Reality Lab to Joan Jensen, Solberg Success Center. Photo by Tyler Ingham. 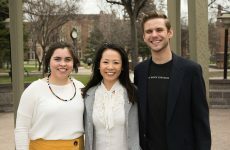 A little help from friends is bringing the Bakken oil fields to petroleum engineering students at UND. From the squeal of the drill as it powers through shale to experimenting with new extraction technology, four new labs offer students hands-on experience at the Collaborative Energy Complex. A grand opening Thursday, Oct. 12, let oil executives, state legislators and other dignitaries experience the labs themselves. They flooded the labs as they took the helm of drill controls, tried out virtual reality goggles that took them to oil rigs, and “tested” samples, commenting on how much engineering education has changed. 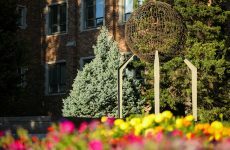 They were wowed by the technology, which brings virtual oil fields, about six hours away in the Bakken of northwestern North Dakota, to campus. The Hess/Drilling Systems Drilling Simulator Lab features a control panel and levers that replicate a real drill-floor environment in exacting detail, along with screens that mirror the actual drilling field. 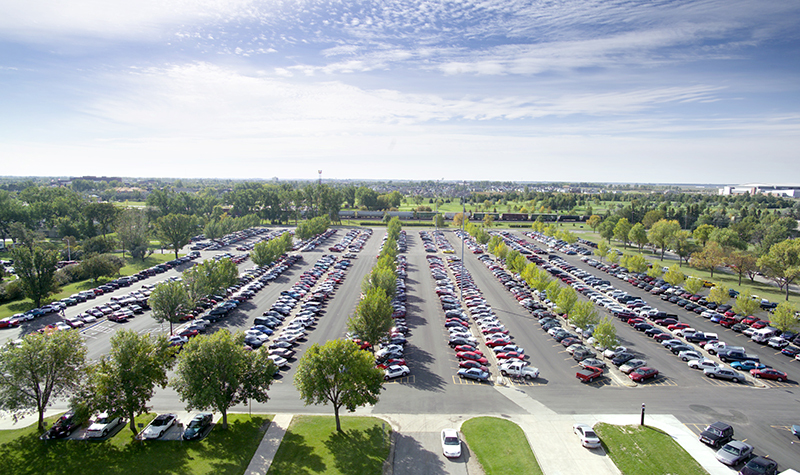 As executives began “drilling,” many commented on how close the experience is to reality. 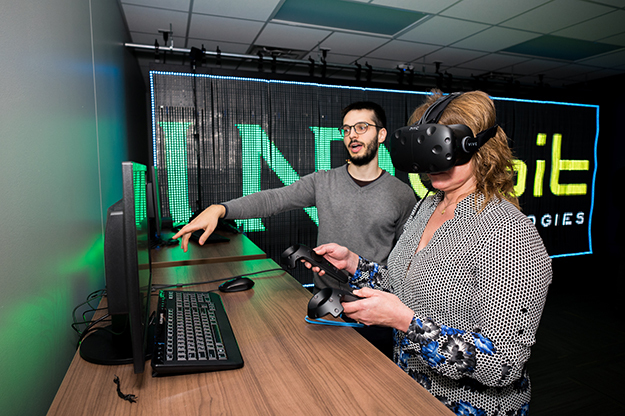 Reality is the goal of the Hess Virtual Reality Lab, which uses 3-D goggles and screens to simulate working on a real rig, impressing visitors with true-to-life details. The Hess Innovation Lab allows students to study shale drilling, and the Hess Teaching Labs enable students to learn petroleum engineering basics and conduct experiments to develop new drilling technologies. 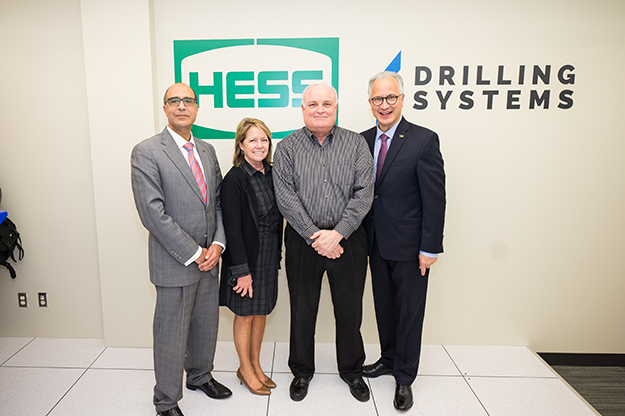 (left to right) Hesham El Rewini, dean of the UND College of Engineering & Mines, Kathy Neset, chair of the North Dakota State Board of Higher Education and president of Neset Consulting Services in the Bakken Oil Patch; Will Lehman, director of geological science and engineering development for Hess Corporation in Houston, and UND President Mark Kennedy. Photo by Tyler Ingham. Many of those partners were present, and are members of the Petroleum Engineering Industry Advisory Council, a group of oil executives who support the petroleum engineering department and foster innovation. “It’s been about seven or eight years since we first started the IAC,” said Will Lehman, director of geological science and engineering development for Hess Corporation in Houston and who recently rotated off the IAC. “We laid out a plan, and formed a partnership with common objectives, and we hope to continue.” Lehmann later said that Hess has been in North Dakota since 1951, and sees great value in having engineers who are educated in North Dakota and have opportunities to remain in the state. 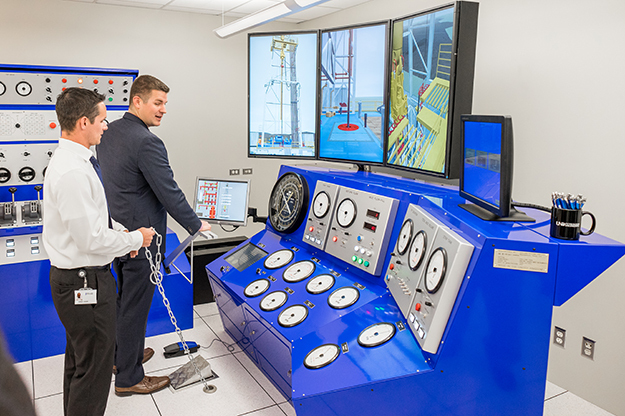 Derek Vioen with Drilling Systems of Katy, Texas, which is one of the donors of the Hess/Drilling Systems Drilling Simulator Lab, demonstrates the “drilling” capabilities to Andrew Eis from Haliburton in Houston. Photo by Tyler Ingham.